Young Park shelter and playground is a perfect place to have a picnic. Call us to see what other amenities are available to make your reservation a great success. It is time to start enjoying the long awaited warmer weather of spring and to begin thinking about the hot days of summer. We hope that you enjoy what we have to offer you, your family and friends. Congratulations are in order for John Orrick (BS), Blake Thomas (BS), Erin Lutjen (BSS) and Carolyn White (BSS) for being the first FFA Members in the history of Blue Springs School District to receive the Highest Honor Missouri can bestow on an individual. These young leaders have earned the State FFA Degree and will be honored at ceremonies at the State FFA Convention in Columbia on April 14 and 15. This is AWESOME news. For those not familiar with the FFA process and awards program… this is a very big deal and a major accomplishment for a program that is only 4 years old….. Congratulations to the recipients, to their instructors, and to the their parents…. Tom Ryan, Store Manager has announced the grand opening of Gordman’s at Adam’s Dairy Parkway on Friday, May 7 at 8:30. You are invited to attend this special occasion for our city. Tom is hoping that LOTS of people will attend. MORE: Take the coupon below to any of the participating Sonics and a percentage of your purchase will be donated to St. Mary's Medical Center Foundation for the "Calling to Care" campaign to expand and renovate the operating rooms at St. Mary's. Bring this coupon when you visit Sonic to ensure a portion of your purchase goes to St. Mary's Medical Center Foundation. Print out the coupon as often as you want and take it in. Dine more, donate more. Blue Springs Parks and Recreation Department will be closing the parking lot off Jefferson Street in Gregory O. Grounds Park for repairs. Gregory O. 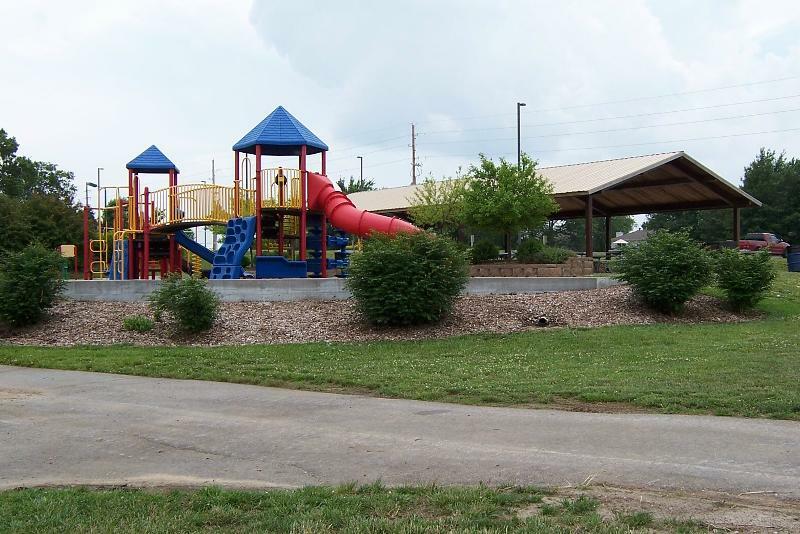 Grounds Park is located in the northeast corner of Blue Springs, north of I-70 and east of Adams Dairy Parkway. Work will begin Monday, March 29th and is scheduled to take two weeks depending on weather. There will be no parking permitted in the lot during that time due to excavation and equipment on site. The area along the lake shore between the lake and parking lot will also be off limits due to the construction and safety issues. We apologize for this inconvenience and will work to complete the project as quickly as possible. Please Pass This Information Along to Your Group! We hope that you will share this information with your civic group or organization by forwarding this email to your distribution list, announcing the events at your meetings, or printing this newsletter to hand out to your fellow members. The mission of the Roundtable is to share information regarding community interest among civic groups, through their representatives, in an unbiased environment in order to communicate with and educate the community. Dental for Kids will hold their annual Princess Party on Saturday, October 2nd, 2010. If you have a little princess in your life, a daughter or a grandaughter- PLAN TO ATTEND! The annual gala event of the St. Mary's Medical Center's Auxiliary, The Butterfly Ball, took place on March 6th and raised $80,000. Funds will be directed towards the $1 million capital campaign to renovate the hospital's surgical area and waiting rooms. This brings the total cmapaign funds to date to $900,000. Rotary member and past president Emagrace Colley has been selected to join a Rotary mission to administer Polio vaccines in Nigeria. Rotary International is a world leader in the initiative to eradicate the world of this crippling disease. Nigeria is one of a few third world nations in which polio still exists. Easter Egg Hunt at Rotary Park- 10am-Noon for children from 2 to 8 years of age. The Rotary Club sponsors this Blue Springs Parks & Recreation department event. FREE for all ages. Adams Pointe Conference Center. Tickets are still on sale for $150 which includes dinner and drinks for two and your chance to win a new car! Also, there is a silent auction. Tickets may be purchased at the door or from any Rotarian. Schools are busy this time of year with student assessments. Construction projects continue at Cordhill-Mason and at both district high school buildings. As reported on the news this week, updated security systems installed as part of the recent construction and remodeling at James Lewis Elementary helped to thwart a would-be trespasser. It is good to know that the improvements provided by our most recent bond issuance are paying off in the safety and security of students! Representatives of BS FIT will be attending a two day conference at the University of Missouri in Columbia courtesy of the MU Extension program and the grant the group received from the Healthy Lifestyles Initiative. The purpose of the conference is to help communities organize program efforts aimed at healthy lifestyle choices in nutrition and physical activity. Next meeting of the Blue Springs FIT committee is Thursday, April 1st at 4:00pm, at the Adams Pointe Conference Center. Here are the notes from our March 2010 meeting of The Roundtable. I hope that the sharing of this information among civic groups and organizations helps to facilitate communication and cooperation within our community. If you are not able to attend a meeting, I encourage you to send your calendar of events and notes about your group's activities so they can be included in our next newsletter. My email address is in the block to the left. Communication is the key! Share this information with your group! Buy Blue Springs "Because Next Door Means More!" You may have seen the banners around the city. And, hopefully you will see more and more about this initiative in the future. Lara Vermillion of the Blue Springs Chamber made a presentation to The Roundtable to introduce the Buy Blue Springs initiative that was launched at the Chamber's December 2009 luncheon. The idea was submitted to Lara by local business owner Mark Whitlow who also agreed to Chair the new committee. Key players and stakeholders met to brainstorm, research of similar campaigns in other communities was gathered and implemented, and a marketing plan is in development. The objective of Buy Blue Springs is to encourage local businesses and citizens to spend locally in order to grow and support local businesses, the employment base, the tax base and the economy. Spending within the community helps to build the overall wealth and economic vitality of our city. Components of the campaign include the Buy Blue Springs banners, their website www.buybluesprings.com, point of sale materials, appearances by their mascot "Little Blue", reusable shopping bags, coupon books, Blue Springs School District Cable Channel 15 commercial spots, and web ads. Local businesses will have many opportunites to buy-in or sponsor campaign elements. The committee is currently working on community education about the program. The completed marketing plan will roll out in April. If you would like to participate or learn more, the committee meets on the last Wednesday of each month at the Blue Springs Chamber office (1000 Main Street) at 8:30am. The next meeting is March 31st. The Chamber office is under renovation and getting a long overdue facelift. The conference room space has been drywalled, painted, and expanded and new carpeting has been layed. This process will now continue in the reception area and offices. Recently, roof and exterior wall leaks were also repaired. The downtown area merchants have been meeting with the Chamber to discuss issues relevant to their businesses. Among the hot topics is parking in the downtown area and results of a recent survey of downtown businesses. The Chamber of Commerce's Leadership Class has adopted St. Mary's Manor as the benefactor for their first annual service project. The group will renovate the patio areas at the facility, and provide new planters and furniture for the residents. The Chamber is encouraging local business people to fill out their "Skill Bank" survey. This is a short online questionaire which will help the Chamber to identify expertise within the community. "Experts" may be called to speak in classrooms or organizations. Please take a moment and fill out the short survey by clicking on the link in the left column. The Chamber of Commerce's Annual Golf Tournament will be held on Monday, May 3rd, at the Blue Springs Country Club. Mark your calendars. Kim Nakahado will join the city staff on April 5th as Public Informaion Officer. Kim replaces Meredith Parrish. Welcome to Blue Springs, Kim! The city encourages everyone to complete the 2010 census form. Accurate and complete census information is important for our cities development! The Blue Springs Police Department introduces the new Youth Police Academy modeled after the very successful Citizens Police Academy which is in its sixth class. March with the Mayor! The 2nd annual fitness walk will be held on Friday, April 9th at 12:15pm begining in front of city hall. Stretch out those winter aches and celebrate warmer weather and healthy activity by joining Mayor Carson Ross for a walk in the downtown area! The new Disc Golf Course (at Young Park, North of Blue Springs South High School) is nearing completion and will kick-off with a tournament on May 23rd. "Time & Place" is this year's public art exhibit which will be unveiled April 1st at Pink Hill Park. Commissioned art pieces will be on display through October 3rd. The walking trail at Ward Park will be renovated and expanded with funds from a grant which is still in the works. Construction dates are TBD. The Centennial indoor pool will be closed beginning April 19th for renovation and replacement of the roof and structure. The pool will reopen in time for Memorial Day. Winning entries of the recent local artist's exhibit and contest are now on display at city hall. Pre-sale of annual pool passes and registration for summer leagues and activities are now underway at city hall. Annual Easter Egg Hunt is this Saturday, March 27th from 10am -Noon at Rotary Park. Free for children ages 2-8. The Wall That Heals- Vietnam Veterans Memorial will be on display at Pink Hill Park from September 30-October 3rd. Volunteers are needed. If your group would like to participate, call 816-228-0137. Welcome Rachel Brown, new Recreation Supervisor with the Parks & Recreation Department began on March 8th! Rachel will work out of Vesper Hall offices. She is a graduate of University of Central Missouri. Have a happy and blessed Easter holiday! The University of Missouri at Columbia (Mizzou) has signed a lease agreement for space at the Heartland Financial Building in Blue Springs. The space will provide for a base of operations that will enable Missouri's flagship research institution to provide support for area research initiatives, outreach services, student recruitment and alumni support. This initial lease is a pre-cursor to a sought after permanent presence in western Missouri in a dedicated facility, the Mizzou Center. Mayor Carson Ross said, "We are very pleased with the decision of the Mizzou officials. Their decision to lease space at the Heartland Financial Building at MIP is evidence of their conviction to have a greater presence in the Kansas City metropolitan area. We have a shared and complementary vision for the Missouri Innovation Park (MIP) and we plan to partner closely as we see our vision become a reality." Bill Wrisinger, Chairman of the Blue Springs Growth Initiative (BSGI), said, "Plans for development of the MIP will move forward. Our land use plan and financial planning will continue as we work to accommodate Mizzou's prospective needs and the needs of other interested tenants. Mizzou's intention to locate an "advance team" in Blue Springs affords BSGI the time needed to execute a land-use plan and to recruit other prospective tenants." Brien Starner, President, Blue Springs Economic Development Corporation stated, "Blue Springs and Mizzou officials plan to move forward together to identify opportunities to aid new and existing companies in meeting their research and commercialization needs. We hope to identify those with whom we can partner and those who may be interested in supporting the Mizzou Center or the MIP financially. Mizzou has affirmed our vision and we have forged a partnership that will bear fruit for both Mizzou and MIP." Mayor Ross added, "It is no secret that our State Government is experiencing challenging economic times. Far from retreating in the face of these challenges, Mizzou is making a courageous and strategic decision to invest in the future of Mizzou and of the Kansas City metropolitan area. We appreciate their confidence in MIP and their commitment to our partnership." The Little Blue River Art Fest committee is now accepting vendor applications for the 2010 art fest. The Blue Springs art fest is Saturday, June 12th 2010 from 10 a.m. – 6 p.m. at White Oak Plaza, near Beauty Brands parking lot grounds. Artists from the area will be displaying paintings, drawings, printmaking, photography, jewelry, ceramics, textiles and much more. The art fest will also feature musical entertainment. For more information or to download an application please visit www.whiteoakplaza.com or contact Kim Jones at 816-260-4235. Candidate forums provide opportunities for those seeking elected positions to speak to the voters and to answer questions on issues and positions. The Blue Springs Business Association hosted a candidate forum at Clancy’s last week, the first of several organizations to host such an event. Each City Council candidate and the two Board of Education candidates had the opportunity to speak regarding their goals to serve our community. I found the predominantly positive outlook among the candidates encouraging. I have a tremendous amount of respect for those who seek to serve their community, and I understand the commitment and dedication that campaigning involves. We each have the opportunity and responsibility to influence the direction of our city through those we select to represent us. Blue Springs has three districts; each elects two councilmen on alternating years for three-year terms. District 1 includes the northern section of the city, District 2 covers the central part of the city, and District 3 covers everything south of District 2. To determine exactly which district you live in, go to http://bit.ly/bsccmap for a map. Review the information on each candidate’s Web site, and contact them if you have additional questions. Talk to them about what is important to you and how you would like them to represent you. Voting is a sacred responsibility. Vote for the candidate you believe will best serve our city. On Thursday, the Blue Springs Chamber of Commerce will host a lunch-hour forum at Adams Pointe Conference Center. Call 816-229-8558 to make reservations. The Eastern Jackson County Builders and Developers Association forum is also Thursday at the Blue Springs Country Club. The social hour begins at 6 p.m. with a dinner for $15 served at 7 p.m. The program follows dinner, during which the candidates will introduce themselves and answer questions from the audience. Louis L’Amour said “To make democracy work, we must be a nation of participants, not simply observers. One who does not vote has no right to complain.” April 6, vote! Following is information regarding another candidate forum for the upcoming April 6th city council election in Blue Springs. Below is a reminder I mailed out to all of our members about the upcoming Candidates Forum we will be holding at our next meeting, this Thursday. If you think your readers would like to attend, please feel free to pass it along. Make sure it is clear that dinner at the meeting will cost $15, so no one is caught off guard. The March Meeting of the Eastern Jackson County Builders and Developers Association will be held on Thursday, March 18, 2010 at the Elks Lodge at 100 NE Brizendine Road in Blue Springs. Social Hour will begin at 6:00 pm, with Dinner at 7:00 pm. Association business and an industry related program will follow dinner. This month we will be holding a Candidates Forum for those running for City Council positions in the Cities of Blue Springs and Grain Valley. Each candidate will have a few minutes to introduce themselves and explain their stance on major issues of their election. A Question & Answer session will follow. Feel free to pass this invitation along to friends, neighbors, and business acquaintances so they can join us to hear the candidates speak. We will also be holding our Annual Election of Directors, so plan to attend. The next regular meeting will be held on Thursday, April 15, 2010.